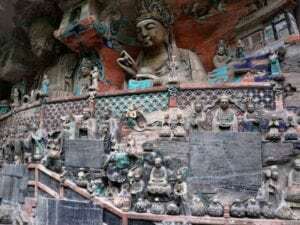 Just west of the city of Chongqing, the Dazu Rock Carvings (Dazu Buddhist Grottoes) are a spectacular site, home to some 60,000 carved stone statues. These majestic and colorful figures have decorated these cliffs for thousands of years. Many represent Buddha, although there are also many Taoist and Confucian carvings to be found here as well. You can also find thousands of intricately carved Chinese characters. The earliest of the Dazu Rock Carvings date back to the 7th century, and were mainly carved during the Tang and Song Dynasties. The statues and inscriptions reflect an important time in the history of Chinese culture. There are more than 70 protected areas in this western corner of Chongqing. The highlights are two specific areas. Beishan Hill has nearly 300 caves carved into its rocky slopes. Baoding Mountain is home to more than 10,000 cliffside carvings, which all tell a story. In the 12th century, one Buddhist monk named Zhao Zhifeng dedicated 70 years of his life to carving sculptures at Baoding Mountain. After these elaborate tributes were carved, the region was off limits to visitors for generations, until it was opened to Chinese travellers in 1961. At the time, the only access in and out of the area was by a small muddy path from the town of Dazu. 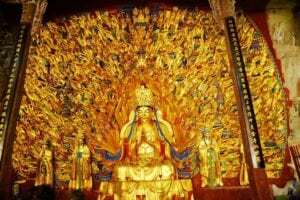 Foreigners were allowed to visit the Dazu Rock Carvings in 1980. In 1999, the Dazu Rock Carvings were declared a World Heritage Site for their beauty, diversity, and for the rich blending of several religious traditions.